Introducing Zohi Interiors’ signature collection of exotic bone inlay furniture and homewares, available online and delivered Australia wide. This timeless range has an everlasting appeal and will create an exotic elegance in your home. We handpick each of these exquisite pieces to ensure our customers only have the highest quality products to choose from. We directly source these pieces from craftsmen in the magical region of Rajasthan, India. Intricately carved pieces of mother of pearl shell and camel bone are individually inlaid into the quality timber in an elaborate floral pattern. Each of our furniture items are lovingly handcrafted by expert artisans in a detailed process that can take weeks. With a selection of beautiful colours and materials, selecting your preferred bone inlay mirror, side table, or other furniture piece can be a difficult decision. We’re here to help, contact us to speak with our interior design team. We would be happy to help you select the piece that is right for your space and style. When styling with this particular material, we like to keep it simple to allow these pieces to take centre stage. 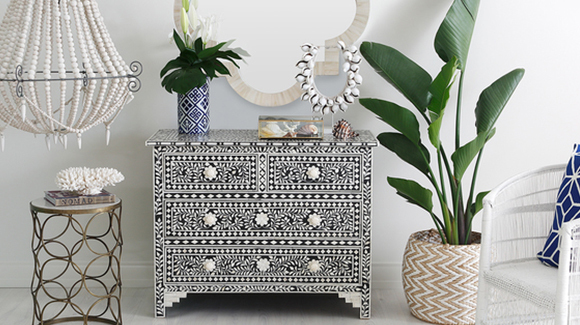 Explore through our stunning collection of bone inlay furniture and homewares including chest of drawers, bedside tables, mirrors and trays.